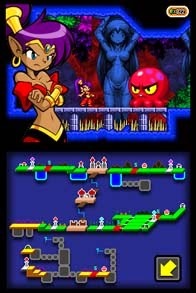 I had some unkind things to say about the original Shantae on the GBC, but given the game’s wonderful presentation and charm, I had high hopes for the sequel, Risky’s Revenge, released for DSiWare in October of 2010 and then on iOS a year later. It didn’t disappoint. The problems I had with the original - the tiny reach of the protagonist’s main attack combined with an overlarge, confusing and brutal overworld - have been addressed in the sequel. Risky’s Revenge is an improvement on its predecessor in almost every way. The story picks up right after the first game, with Shantae working as the guardian genie of Scuttle Town and her piratical nemesis Risky Boots crafting a new plan to conquer Sequin Land and take her revenge on Shantae for foiling her the last time, so Risky’s Revenge is a pretty fitting title. This time around, Shantae must traverse Sequin Land to acquire three magic seals to keep Risky from gaining the power of an ancient magic lamp. Of course, it’s all an excuse for Shantae to go off adventuring again, and as far as excuse plots go, it does its job of fading into the background without completely disappearing. Stylistically, Risky’s Revenge shows an imagination and aesthetic drive equal to its predecessor, but with the help of almost a decade’s technological advancement. The soundtrack is a combination of tunes from the original - updated to modern sound technology - and completely new tunes, and they’re all catchy and memorable. 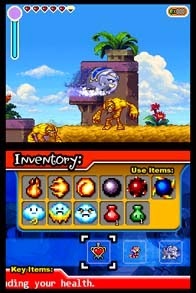 Graphically, Risky’s Revenge is beautiful, with great visual design and smooth animation, although it is a bit puzzling that characters’ in-game sprites show a different shading style than their dialogue portraits. 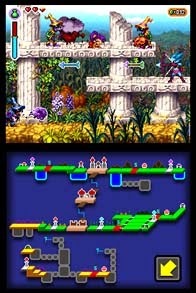 The gameplay is largely the same as the first game with several small but significant changes. First, Shantae’s hair actually has respectable range this time, and second, there is an option to automatically run instead of having to hold down the attack button. Animations for Shantae’s transformations have also been shortened, making changing forms feel like less of a chore. The action also pauses this time around when Shantae is performing her transformation dances, meaning you won’t get blindsided by enemies while helplessly transforming. All of these changes, along with a greater attention to level and enemy design and placement, make the gameplay in Risky’s Revenge feel fluid and satisfying. On a more big-picture scale, Risky’s Revenge is a metroidvania platformer with a wide world to explore and plenty of secrets to find. The game puts me in mind of a side scrolling Zelda game (no, not like Zelda II, sit down) with its macguffin quest and structure of an expansive overworld interspersed with dungeons and side areas. There’s one mechanic in which some areas have multiple “layers,” and in certain places Shantae can jump into the foreground or background to access a different layer. It feels unintuitive, and makes some areas feel more confusing than they really are. Once you’ve wrapped your head around it, it’s easy enough to navigate different layers, but it nevertheless seems like an inelegant way of doing things. Still, it’s not enough of a sticking point to ruin the experience by any means. All in all, Risky’s Revenge takes everything that was great about Shantae - the winning style and engaging dungeons - while weeding out or correcting the problems that held it back. I went through Shantae wondering when it would end, and I finished Risky's Revenge hungry for more. Risky’s Revenge is a great pick for anyone looking to scratch that classic platformer or metroidvania itch, and I eagerly await the next installment in the series. Now, all of this is based on the DSiWare version, played on a 3DS. The game is also available on iOS, however, and I would be remiss in my duty as a critic if I didn’t issue a word of caution over this port. The game’s content is, as far as I can tell, largely unchanged, but touch screen controls have not been kind to Shantae. The iOS version uses a virtual joypad and buttons, and I, for one, could not get used to them. A game like Shantae requires a certain amount of precision in its control scheme, and it helps immensely to be able to tell what button you are pressing without having to look. Without the tactile feel of a physical button, the iOS port loses that feedback, and you’ll have to blindly guess where the buttons are and hope that your thumb is tapping in the right place. The iOS version is compatible with external controllers, however, so if you happen to have one, use it. The touch screen controls are just too fiddly and imprecise for me to really recommend Risky's Revenge on iOS unless you do happen to own an iOS compatible controller.